We look at four key talking points from the opening games of the women's 6 Nations. It is early days in this year’s competition but it already is clear that England and France are playing on a very different level to everyone else. Even with key players missing, France secured a record win and that was with 7/9 conversions being missed. The 52-3 result actually flattered Wales. Those who run the 6 Nations should be concerned that the Championship looks a two horse race, and with England and France turning professional and semi-professional, they are likely to continue to pull further way with no sign that the others are going to follow suit. This fuels questions about the present format of the women’s tournament. Should it mirror the men’s tournament or find something that works best for the women’s game? If sponsors are to be seriously attracted to the competition, they will want surely to be involve in something which is truly competitive where more than two teams could win it. Food for thought. Italy’s ranking is no accident. Italy are ranked third in Europe and it is clearly no accident. They defended for much of the second half against Scotland with the Scots barely getting a sniff of the line, then pounced with two quick tries at the end for the bonus. It was almost clinical, although they were of guilty of squandering lots of chances to put the game far beyond doubt earlier on. In Giado Franco they have unearthed a powerful backrow force and the Italians now have an extremely settled side two years out of a World Cup with the likes of Beatrice Rigoni, Michela Sillari and Manuela Furlan offering cutting edge and experience. With back to back home games to come against Wales and Ireland, they will have returned to Italy with great confidence and must well believe they can go on to secure wins two and three. On paper, Ireland’s crowd of over 4,000 to watch them take on England was a huge positive. But the excellence of Ireland's home support masks the fact that a 5pm KO on a Friday evening in a capital city is ridiculous and highlights the major issue facing a Championship which runs three overlapping identical competitions in the men’s, women’s and U20s all over the same weekends. We know that broadcasters want to show women’s games – they tell us much and have had good return for their commitment – but they will not do it at the expense of any overlap of the men’s game. So in come 5pm kick-off times on a Friday evening, rubbish for fans who want to watch at home, and difficult for travelling supporters. It is a huge headache for the 6 Nations and something they will need to solve if the tournament is ever going to secure the backing of major sponsors. Thursday night test rugby anyone? England were excellent in Dublin last weekend in almost every facet of the game – patient in defence and clinical in attack, but their scrum wobbled and boy will France target it this weekend. 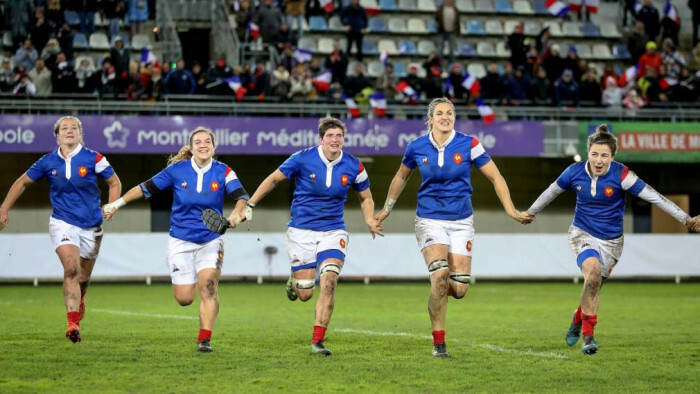 As brilliant as Sarah Bern and Hannah Botterman were around the pitch in the loose, they will be in for a challenging night when they pack down against what is becoming an extremely dominant French scrum and no doubt this is one of the key areas France will be expect to dominate. Despite being off the pace in the game, Ireland had the upper hand in this particular area, and that will be a real worry for Simon Middleton.